To reach a wider group of executives and help them become more productive and effective leaders. Our Leadership Bootcamp is based on the four professional development needs most of our executive coaching clients require. We start with the four most common “areas of improvement” our clients face following an initial assessment in the same sequence we follow with them. Time efficient—each module is structured to ensure you gain and retain key points, combining behavioral theory with weekly exercises and practice. “Cuts to the chase”—each module is boiled down to its essence. We skip over theory where we can, and focus instead on the most important things to remember when changing behaviors. Economical—the cost of our Leadership Bootcamp is far less than the rates we charge individual coaching clients. While concepts discussed in this course will appear to be obvious and intuitive, the proof is in the pudding. Success starts with knowledge, but ultimately it’s measured through behavioral change. Understanding what should be done and actually doing it are vastly different. The measure of your success is doing things differently, better, and more productively. Behavioral change, as you’ll learn from this course, happens immediately and over time. Since old habits can be difficult to break, sustaining your behavioral changes takes diligence and persistence. Class Size is limited. Each one-hour module includes a manual summarizing key points. Contact us if you may be interested in joining our next Leadership Bootcamp. 1. Click the “Contact Us” button to schedule a brief call to learn more about our next Bootcamp. 2. Complete a Self-Assessment form, which we’ll review with you during a scheduled 30-min call. 3. Attend our first Leadership Bootcamp session free of charge. 4. If you decide you would like to attend the three remaining Bootcamp sessions, you may enroll at that time. There is a $800 fee to attend the full Leadership Bootcamp. This bootcamp is intended for senior and executive leaders of mid-sized companies managing one or several teams. Please contact us if you have questions about whether your background fits our selection criteria. For testimonials please scroll down this page. 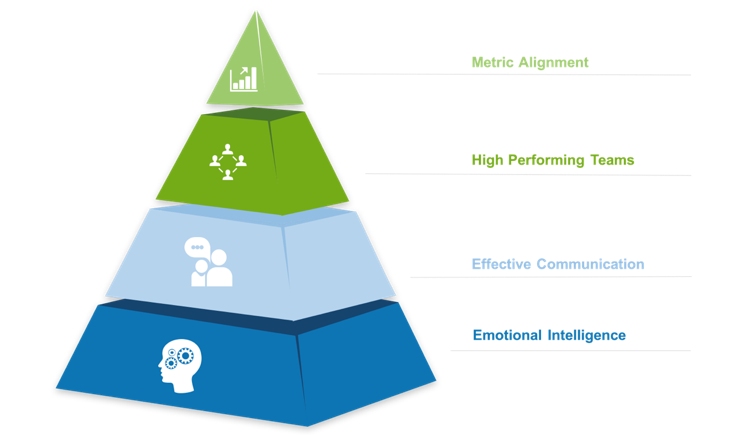 We start at the bottom of the pyramid and look at each executive’s Emotional Intelligence or “EQ”. From there we look at their communication style. Both of these dimensions are essential in building strong and productive teams, which is level 3. At the top of the pyramid is making sure your own team and your managers’ teams are aligned to a scorecard with several key metrics. In football, basketball, and soccer, it’s easy to see which team is winning. While it’s not as easy to do the same thing in business, we believe too many CEOs shy away from aligning their companies to a handful of metrics identifying success. Each level of the pyramid has an associated coaching module. The four modules in the current course are the most essential and will generate the greatest gains for you in the shortest amount of time. The CecondOpinion Bootcamp proved quite valuable. The weekly topics are applicable to anyone in a management or executive role, and the homework provided a great basis on which to have productive discussions. The structure of learning with peers helps to leverage other people’s experiences, both successes and failures. (It also helped to keep me honest in doing the exercises!) I particularly liked the Organization Alignment topic, which forced me to look at an ongoing issue with a different perspective. I would recommend the Bootcamp to any manager or executive who is interested in improving their self-awareness and productivity skills. Bootcamp provided me an opportunity to focus. The topics were not things I didn’t know, however, they are the things that get dropped, forgotten or assumed as you progress in your career. Going back to revisit these topics in hindsight was so beneficial. The group dynamic was great during the calls and site visits. This was a great program and I would recommend it to anyone!